I don’t recommend this. Very slow and don’t see that much. We ended up leaving halfway through as it stopped where we started and said the next leg wasn’t for 30 minutes. We chose to not finish as it was so slow we could see more on our own. Not bad really but it seems like the ferry takes the same route with far less cost. Guide had some good insights but hard to hear at times. A very nice, gentle tour. Melbourne does not have the overpowering BIG tourist sites to see, like Sydney - but we enjoyed this gentle trip listening to some of the history. All ran very well. Were unable to take the tour booked as the river was closed so a trip in the opposite direction was substituted. It was an hour through mostly industrial areas ending at Williamstown, right across the port from our ship. It was a cute little town but basically nothing there. So, lunch and another hour back to Melbourne. Missed seeing Melbourne which we heard was very nice. 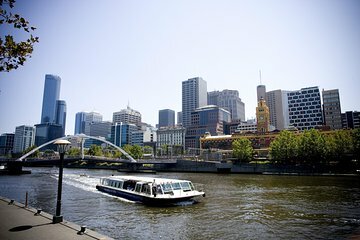 Would definitely recommend waiting until you get to Melbourne to book as there are lots of river cruises to choose from. This was good value for money, and gave a different perspective off the city. Nice cruise but too much going from one boat to another. I had an excellent time on the Highlights of Melbourne Cruise. Cruising up the Yarra River and back and seeing the Southbank and parts of Melbourne was sooooooo fun and a great way to see the beautiful city. This I do recommend or anyone wanting to see the city and relaxing along the way also! Ein einmaliges Erlebnis. Es ist eine Buchung wert! Chose a nice day for this tour! Directions weren't great, found it hard to find but the tour itself was good!